Sick Note No Fish and I enjoy exploring restaurants together, and it was time for us to visit a place neither of us have been before. Tate Dining Room and Bar isn't new, and has been on my "to tick off" list for a long time, but somehow I've never found the right people to go with. So I was particularly happy when No Fish agreed to accompany me tonight. We decided to choose the smaller of the two tasting menus, entitled Sensualist Menu. A lighter load would be good for me after a heavy eating schedule over the last week. Wood - smoked eel roll. Not bad. It's "wood" because it was smoked. Water - dashi (出汁) ravioli. Spherification. Fire - sweet corn panna cotta with crispy bacon. Loved the sweet corn flavors, and apparently the corn kernel inside was grilled... hence it's "fire". Earth - mushroom panna cotta. Yup, definitely tasted the earthy flavors of shrooms. Ode to tomatoes : five types of tomatoes tartare / strawberry tomato gazpacho / smoked sardine / Marrakech lemon skin confit / 5 herbs - a refreshing and delicious dish. I loooove gazpacho in the summer, and this one was very, very nice - with some fraises des bois blended in. Slowly mix in some of the quenelle of Pommery mustard ice cream, the tomato tartare, the fraises des bois, as well as the tiny chunks of smoked sardines... and you have one delicious mouthful of chilled goodness. I could eat this all day. 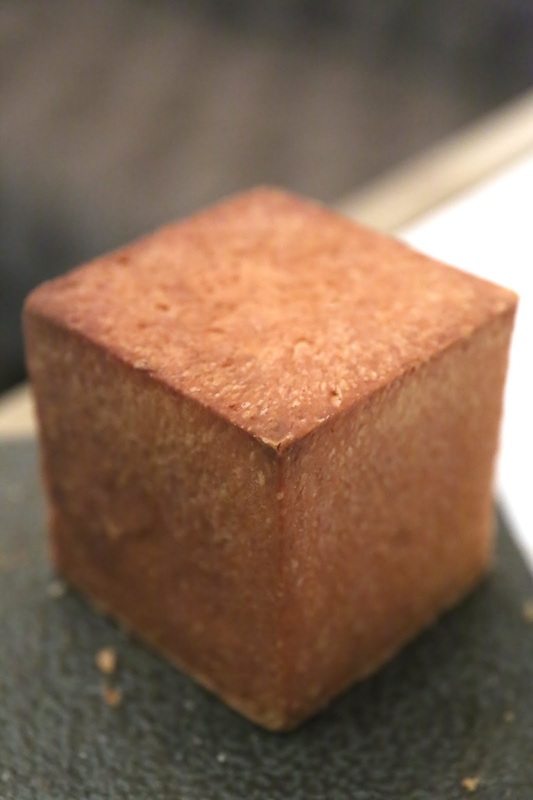 After we finished our first piece of bread, this cubic brioche showed up. This totally reminded me of Dominique Ansel's Magic Soufflé... and was very, very delish. I resisted the temptation to finish it, because I wanted to make sure I didn't fill my stomach space with bread tonight. The sea : scallop espuma / taraba crab meat / yuzu gelée / marinated jelly fish - the scallop espuma was very nice, as was the red king crab (鱈場蟹). The yuzu (柚子) gelée wasn't immediately apparent, and neither was the jellyfish. But hey, the combination of ingredients tasted good. The fish consommé rice paper on the side was definitely interesting... and aesthetically pleasing. Hokkigai clam : root vegetable mille feuille / summer black truffle / cauliflower black garlic espuma / fresh water clam sauce - the Japanese surf clam (北寄貝) was actually pretty tender while retaining enough of the springy texture. The espuma was interesting... as the flavors were a little heavier here. The "mille feuille" featured Japanese turnip (蕪菁), potato, and carrots... and accented with a couple of chunks of Japanese kelp (昆布). Pretty nice. Rosé Bresse pigeon : slow cooked breast of pigeon / filo pastry wrapped fermented mustard green thigh of pigeon / roasted baby beetroot / pigeon jus - OMG. The breast of Bresse pigeon was no doubt cooked sous vide... and it was sooooooo tender. Yielded to my Laguiole knife like buttah... I would eat another serving of this, right now, without any hesitation. The shredded thigh meat was interesting, and it was mixed with diced celeriac which provided a little crunch. I did taste some fermented flavors. Honey, milk and chamomile : home made Wing Ho Hong Kong Bee Farm honey ice cream / chamomile white chocolate mousse / dacquoise / yogurt meringue / Williams pear cream - undoubtedly the weakest dish tonight. The honey ice cream was pretty nice, as was the camomile and white chocolate mousse hidden underneath the yogurt meringue and dacquoise. But the honey gelée was pretty bland... and there wasn't much of the Williams pear cream to make a difference. Very pretty presentation here, but flavors weren't outstanding.